No disrespect taken. And the reason I used the Cougar as an example is that unlike a Pinto, but much like the RX7, they are sports cars. 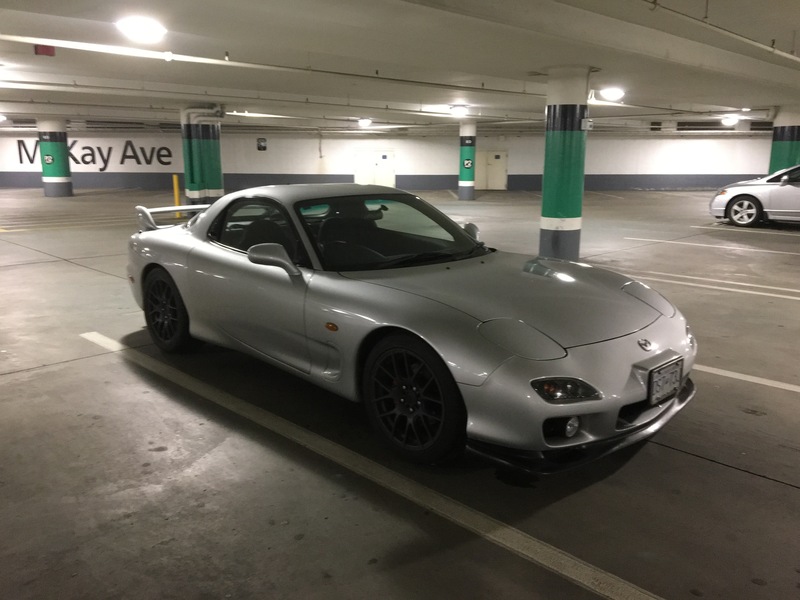 The biggest differences being RX7s being half the age, Japanese, and a 20x higher survival rate because people bought them and cared for them. I can expect mine to be 1 in 40 surviving and if returned back to factory condition 1 of maybe 5, I'm not going to ask the same as an XR7-G cause it's just not going to sell. I guess I should have started by asking if everyone is valuing off of rarity more or sentimental value. I think another factor you did not take account of is addressable market. Demand for Cougars (not middle age women) are probably small relative to FDs. There might be 6 times the FDs available over Cougars, but if the demand is 10 to 20x of the Cougar, price will continue to go up as supply is constant or diminishing. That is a valid point, Cougar community is smaller and getting smaller by the day. Reality is the RX7 community really isn't much bigger and that could very well be due to it being more recent. I think the reason this community isnt bigger is the prices the current owners ask. You see an average Gen 3 going for 16-28k. That same 28k will get you a brand new or 1 year old 400hp mustang. Granted I'm not an owner and never will be with these kind of prices so I'll just break down from an outside view that still appreciates the cars for what they are. Frankly the only reason I see the prices staying higher is because you get the few hopefuls that held onto this as their dream car regardless of what has come around and finally after decades of saving and shopping around can afford one or the guys that have previously owned on and sold theirs for a similar price. We all know these are not head turners to anybody that doesn't know what it is and it doesn't have the history of cars that have stuck around like the Mustangs or Fairladies. Just to be clear this isn't intended to be a bashing sort of post and I know someone will take it personal, but that is an outside view from a guy that loves all cars for the differences in each of them. I'm having trouble taking you seriously. Have trouble with it by all means, but convincing someone that has not been a part of the community that these cars are worth the same as a new sports car is obviously not an easy feat. Like Fritz said if your asking close to 30k you really aren't trying to sell you car. To add to that you're just putting it out there to snag an unwitting buyer. Bro... as much as I love a 94 white RX7 (I got one). No way they are worth 36k+... I can see them going for 20-25K for a nice one. Not 36k+...at least not now. Closer to $0.00. You don't seem to have a clear concept of the actual market, or the cars themselves. Just because you're not part of the community doesn't mean you're representative of anything. You're just one silly data point. I believe he's trying to discuss the 1 pearly white FD. But, any nice CW FD with no sunroof is gonna be near the top of the FD spectrum. I was referencing the pearlie white 1 of 1 PEP not the average FD, I apologize for the confusion. That is why this thread was started if I'm not mistaken, it was to educate those outside of the community and the members itself. You were right in catching on that I was referencing the Pearlie White. However, if the market is filled up with people that would rather not help someone under stand y'all can keep your cars "for sale" thinking people aren't laughing at some of the figures they see. Somebody got all sensitive in the "what's your car worth thread". But seriously no need for the attack. Getting pissed on the internet is retarded. Guy is right, though. I have just as many people ask me what in the hell my car IS as even recognize it is a RX7. Small shrinking market and people outside of the FD game will rarely see the value that those in here do. The bright eye'd kids who think they are cool don't have money for it and those with the money are looking at corvettes. Given what the cars are, what they require, the mod to value dollars you dump into one to keep up with a new vette, and the fact that they ARE old makes the 30k value regardless of mileage insane to anybody other than a collector who won't drive it. We'll be fine. Best of luck with your Mercury. There are plenty of owners with corvettes and FDs. Different markets. There's no class or style in a late model corvette. Just brute performance. You want a pristine and well optioned FD? You gotta cough it up. Don't believe me? Keep waiting. I could pay cash for any car here currently for sale, but I really wouldn't want to drive it as much as my other collectibles due to the known maintenance needs. (Drive it to keep it working but not so much you hit that 50k and need to start thinking of a rebuild) That's why cars like Ferrari 355 are less sought after, people can't enjoy them as much as they would want. From the research I have done about FD your options difference from base model to PEP was stereo, leather, sunroof, cruise control. To the mass majority those are basic options and few that look for RX7s care about any of those. Cruise control is nice for long trips, if you take them. Sunroofs are arguably not a desirable option, because they eat up headroom. The 94's came with a glass sunroof, which is nice if you're into that. The upgraded bose stereo system also eats up trunk space, breaks more, and is harder to repair or replace later. The cd player option used to be nice, but I'd rather have a stock radio w/cassette or a modern deck with aux, these days. So, in that sense less options is generally more desirable. The 94+ cars came with way better interior plastics and way better interior color schemes. Tan and red panels are not much loved because they get dirty and don't match the dash. The panels are all black in 94+. Only the carpet/seats would be red or tan. 94+ cars also got some other small improvements, and suffer fewer of the common rx7 niggles. Base models got nice cloth seats, which I like best of all. r1/r2 cars came with suede seats, also nice. And, they got an extra oil cooler, which is worth upgrading. Then there's colors, which is personal taste. Red and blue are most common. And, probably least desired. Black, White, Yellow, and Silver are rarer and more desirable. CYM was a 93 r1 only color(350 in the US). White is a 94+ only color(which makes it kindof rare de facto). An r2 in a nice color has relatively few options, but is probably the most desired options package. But, it all depends on what you want to do do with the car. If you wanna build it wild like Skeese and don't care much about originality or sunroofs, then it's all the same I guess. Last edited by Narfle; 03-23-17 at 12:24 AM. A rare case that comes along all too infrequently. A local seller recently put his red 93 USDM up for sale for C$9,500. He'd held the car for 15 years, but may not have been keeping touch with the market. Offers have now topped C$17,500. Its been heard the car has 200,000 km, or miles (not specified), on it. Last edited by Redbul; 03-23-17 at 12:56 AM. I tend to look at them as generalized, obviously if I was looking for a strict collectable I'd be concerned with the options. I look at them as something I would enjoy driving, not racing and just to have something a little different with some history such as it being part of the dirty trio of 90's Japanese sports cars. My ideal one would be literally any trim level Yellow, Blue, maybe Silver with black interior and whatever options happen to be there. Without you stating it I would have not looked too much into a second oil cooler. I'm not saying these cars aren't worth close to 20k I'd happily pay 22k for a Yellow on Black with a manual that I can get a good years worth of road time in before have to contemplate any significant repairs and I'm also not naive to think that would be a blue moon kind of moment because it seems everyone either stores these to look at them or tracks and beats on them. So, the middle is where I will live and be content I don't need one to enjoy looking at someone else's and I don't have to pay 30k to do it. Perhaps you'd be interested in a low mileage RHD, then. Last edited by Redbul; 03-23-17 at 12:51 AM. I'd be lying if I said I have not considered it, but 17k plus 2700 for a car getting shipped across the ocean and hoping it's in driving condition isn't the most appealing idea when looking for a driver. Could easily get close to the other 30k asking price fixing the car when not experienced with them. You're post about the 93 in the great white north didn't go unseen, but a year too soon. I wouldn't know where to start with getting it across the boarder let alone want to store it for a full year with wanting to drive it the while time. That 93 is a USDM. I.e. an original us import. More than a few of those have made there way to Canada over the years. Frankly, though, RX7, either LHD or RHD, have suddenly disappeared from the classifieds up here. Even parts rollers are not appearing. Something is going on, and perhaps you are a year too late, actually. I definitely misunderstood, so it's a 93 that meets US regulations and just happens to be RHD? That adds a-whole-nother level to the debate of value then based on year of purchase, unless the general consensus is that regardless of car origin price is equivalent then based on rarity or options. Sorry to mislead. That particular 93 is a LHD as it is a USDM. There were LHD imported to Canada as well. They are USDM with some special equipment for Canada. Many of such "Canadian USDM" were made in 1992, and so would likely be available to export to US as well. The Canadian USDM were available for sale as early as April 1992 in Canada. But to be clear the 93 referred to above was an original US import that somehow ended up in Canada. What would be required to re-register it in the US, I don't know. Last edited by Redbul; 03-23-17 at 01:38 AM. I wouldn't imagine it would be too difficult to essentially bring it back to the states apart from finding transportation. And that would make an interesting story for how someone got a hold of it. Though I do feel we are very close to getting off topic now lol. I would value imports with the same prejudice as any other car. That means miles, rarity, condition just like every other vehicle. But who's word does the world go off of to put a concrete value to these cars or do we just live with the 16-30k gap?